“After that, at Zündel's expense, he [Leuchter] left for Poland with a secretary (his wife), a draftsman, a video-cameraman and an interpreter. He came back and drew up a 192-page report (including appendices). He also brought back 32 samples taken, on the one hand, from the crematories of Auschwitz and Birkenau at the site of the homicidal ‘gassings’ and, on the other hand, in a disinfection gas chamber at Birkenau. His conclusion was simple: there had never been any homicidal gassings at Auschwitz, Birkenau, or Majdanek. Some falsehoods on behalf of Fred Leuchter can be found in the homonymous entry at Wikipedia. Before examining them, however, it is pertinent to make a caveat. The Wikipedia text contains expressions such as “practicing engineering” and “professional engineer.” It must be kept in mind that in most other languages, the term engineer refers exclusively to individuals who have an academic degree in engineering, whereas in the English language it has a far broader meaning. In addition to academic engineers, the term can also refer to any kind of technician. a spurious criminal complaint was filed against me in the Massachusetts court system with the intent of destroying my reputation by putting me in prison for three months. So much from Leuchter. For my part, I observe that the document signed at the time by Leuchter was a consent decree, a settlement agreement that does not include an admission of guilt on the part of the person concerned. Therefore, it seems unlikely that he was given “probation,” which instead presupposes guilt (and a conviction). In November 2005, Francesco Rotondi, cardiologist at the San Giuseppe Moscati Hospital in Avellino, published a book titled Honeymoon at Auschwitz: Reflections on Holocaust Denial. It is a full-fledged anti-revisionist libel, filled not only with falsehoods, but also with pure slander against revisionists. At the time, Carlo Mattogno responded to this book for his part. Mattogno’s answer, however exhaustive it may be, concerned almost exclusively the objections brought against his own work. It did not take into consideration the poisonous ad hominem attacks made by Rotondi against Zündel and Leuchter. I try to respond to these, despite the time that has passed, first of all because Rotondi’s book was favorably received by Italy’s academia (before being published by an Italian science publisher, it had been presented as a thesis) and also because I think it is always useful to show the bias of revisionism’s detractors. “Leuchter’s credibility” (“La credibilità di Leuchter,” pp. 70-73). In the second section under review here, Rotondi’s claim that Leuchter boasted to have a degree in engineering is the first slander in that section. From the text of the agreement it is clear that the dispute did not concern a graduate degree but Leuchter’s failure to register with the Board of Engineers. If Leuchter had indeed boasted of such a degree, there would have been no agreement, and he would have gone straight to prison. From this point of view, it is also tendentious to have defined the aforementioned “Consent Decree” as a “judicial plea bargaining,” which instead presupposes both an admission of guilt and a subsequent conviction. “I realized that North Americans were not interested in being educated. They want to be entertained. The book was for fun. With a picture of the Führer on the cover and flying saucers coming out of Antarctica it was a chance to get on radio and TV talk shows. […] And that was my chance to talk about what I wanted to talk about." As to the second book, the Italian Wikipedia entry on Zündel states that he denied authorship of that book. It is not easy to be more biased than Wikipedia when it comes to revisionism, but Rotondi evidently succeeded in that. “Thomas held that Leuchter had no expertise whatsoever in crematories and disallowed any testimony relating to crematories.” This is the entire sentence that Rotondi speciously truncated in half. Moreover, the same Judge Thomas, although far from being well-disposed toward the defense, recognized that Leuchter had the qualification of an engineer and was expert on gas chambers. And Rotondi cannot claim that he does not know Kulaszka’s book, since he mentions it in a note on page 68! That sentence is not criticism but real character assassination. And yet, in this case it is Rotondi himself who is not the least worried about being exposed as a liar. Even in this sentence, there is no dearth of lies. Anyone who has watched Errol Morris’s documentary will have noticed that Leuchter’s voice is absolutely normal, and that he does not chuckle continuously for no reason. (I am also unaware whether Leuchter has ever been photographed with the noose around his neck). Finally, I venture to doubt that Faurisson, in an article for the French weekly Rivarol, spoke of Leuchter as a “genius” (p. 72). Rotondi provides neither the issue nor the page number. Another copied and pasted quote without verification? In 2009, Italian scholar Aldo Giannuli published a book titled The Public Abuse of History: How and Why Political Power Falsifies the Past. As we read on the Book’s flaps, Prof. Giannuli is a researcher of contemporary history at the University of Milan. He was a consultant for the prosecutor’s offices in Bari, Milan (on the Piazza Fontana massacre), Pavia, Brescia (on the Piazza della Loggia massacre), Rome and Palermo. From 1994 to 2001, he collaborated with the Italian Parliamentary Commission of Inquiry on Terrorism in Italy and on the causes of the failure to identify those responsible for the massacres. One single observation is due here: if anyone is a crook and an impostor here, it surely is not Leuchter. Moreover, it is not true that Leuchter based his research exclusively “on the works of Robert Faurisson.” Actually, Leuchter wrote four expert reports in total, and his fourth report is dedicated to a technical evaluation of Jean-Claude Pressac’s magnum opus, Technique and Operation of the Gas Chambers. To conclude, although it certainly is true that a headline does not suffice to elaborate on the problems raised by the (first) Leuchter Report, the three paltry – and pitiful – pages dedicated to it by Giannuli aren’t enough either, just as the other three pages dedicated by Giannuli to revisionism in general (his pages 112-114) are not enough compared to the monumental historiographical and scientific work published in recent years by authors such as Carlo Mattogno and Germar Rudolf. Rather, one wonders: how come, when it comes to revisionism, even authors like Giannuli (but I also think of Giovanni Fasanella) who are used to “flying high,” end up sinking below sea level? F.A. Leuchter, R. Faurisson, G. Rudolf, The Leuchter Reports: Critical Edition, 5th ed., Castle Hill Publishers, Uckfield 2017. Read it online free of charge, download a free PDF file, or purchase a hard copy at www.HolocaustHandbooks.com. “Since 1965, he has worked as an engineer on projects having to do with electrical, optical, mechanical, navigational and surveying problems. He holds patents in the fields of optics, navigation, encoding, geodetic surveying and surveying instrumentation, including patents on sextants, surveying instruments and optical instrument encoders. Since it was written, the Leuchter Report has been the object of many criticisms: sometimes honest, often dishonest. Of course, it contains some flaws which the revisionists themselves have detected, but being a pioneering work, this was inevitable. What I wanted to point out here, however, is that it is still the work of an expert who had every right to express his dispassionate opinion, a right that Jewish organizations and many societies have tried ruthlessly to infringe upon as a warning to everyone, experts and non-experts alike, who dares to speak out freely and frankly on the greatest taboo of our time. Translated from the Italian by Germar Rudolf. The original appeared with the title “Omaggio a Fred Leuchter, presunto millantatore e vero engineer” at www.andreacarancini.it/2018/01/omaggio-fred-leuchter-presunto-millantatore-vero-engineer/; Jan 27, 2018. Robert Faurisson, “The Zündel Trials (1985 and 1988),” The Journal of Historical Review, Vol. 8, No. 4 (Winter 1988), pp. 417-431, here p. 428f. ; see also R. Faurisson, “Preface,” in: F.A. Leuchter, R. Faurisson, G. Rudolf, The Leuchter Reports: Critical Edition, 5th ed., Castle Hill Publishers, Uckfield 2017, p. 16. Mario Soldati, La sposa americana, A. Mondadori, Milan 1980, p. 55; English: The American Bride, Hodder & Stoughton, London 1979. Leuchter also told me that the aforementioned agreement and the details of the same should never have been made public by court order and that the parties – Leuchter, the prosecutor, the Jewish organizations and the technical council – would never have to discuss publicly the agreement or its contents. But a few days after the formalization of the agreement, the Jewish organizations spread some of the contents and added lies to the rest with the approval of the public prosecutor. Francesco Rotondi, Luna di miele ad Auschwitz: Riflessioni sul negazionismo della Shoah, Edizioni scientifiche italiane, Napoli 2005. Robert Faurisson, “The Zündel Trials (1985 and 1988),” The Journal of Historical Review, Vol. 8, No. 4 (Winter 1988), pp. 417-431, here p. 418. Barbara Kulaszka, ‘Did Six Million Really Die?’: Report of the Evidence in the Canadian ‘False News’ Trial of Ernst Zündel – 1988, Samisdat Publishers, Toronto 1992, aaargh.vho.org/fran/livres3/KULA.pdf, p. 733. B. Kulaszka, op. cit. (note 7), p. 734. Fred A. Leuchter, “Is There Life After Persecution? 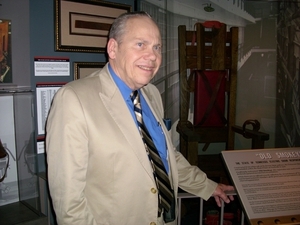 The Botched Execution of Fred Leuchter,” The Journal of Historical Review, Vol. 12, No. 4 (Winter 1992), pp. 429-444, here p. 430f. Mark Weber, “Fred Leuchter: Courageous Defender of Historical Truth,” The Journal of Historical Review, Vol. 12, No. 4 (Winter 1992), pp. 421-448, here p. 423. Aldo Giannuli, L’abuso pubblico della storia: Come e perché il potere politico falsifica il passato, Guanda, Parma 2009. Wikipedia states instead that at that time he was a professor of political sciences at the University of Milan. F.A. Leuchter, R. Faurisson, G. Rudolf, op. cit. (note 1), pp. 227-245; Jean-Claude Pressac, Technique and Operation of the Gas Chambers, Beate Klarsfeld Foundation, New York, 1989. Op. cit. (note 13), p. 425.